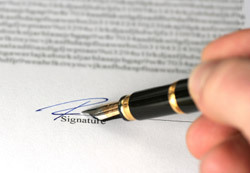 A breach of contract is a failure to perform under the terms of a contract. However, not all breaches are the same; a Fairfax business attorney will explain that depending on the nature of the breach, the aggrieved party will have different rights and remedies. If the breaching party’s actions render the agreement so irreparably broken that it defeats the purpose of the contract, it will be considered a material breach. Where a breach is material, the non-breaching party may immediately suspend performance under the contract and sue for damages. Determining whether the breach was material is a matter of fact that a Fairfax business attorney must prove. • Can money compensate the non-breaching party? • What will the breaching party lose or forfeit if performance is suspended? • What is the likelihood the breaching party will correct the breach? • Did the breaching party act in bad faith intentionally or was the act a result of unfair dealing? • Was the non-breaching party ready, willing and able to perform before the breaching party’s actions? • What does the contract say? Rather than rely on judicial interpretation, a contract drafted by a Fairfax business attorney may specify that a failure to perform a certain provision is a material breach. If a party to a contract you have entered into is not living up to their end of the bargain, you need to explore your options with a Fairfax business lawyer. Begin with a call to Schleifman Law, PLC, a Fairfax business attorney, at 703-528-1021. Virginia is what is known as an employment-at-will state, which means that the general rule is that an employee can be fired at any time, for any reason or for no reason at all. The exceptions, a business attorney in Fairfax explains, are that an employee cannot be fired for illegal reasons, such as discrimination or for reporting unsafe working conditions or if there is an employment contract indicating circumstances under which an employee may be terminated. An employment contract may be written, oral or implied. Proving the existence of an implied contract is a more difficult burden for a business attorney in Fairfax. Proof is implied from the actions and statements of the parties as there are not writings or oral promises to cite. Policies of the employer that indicate firing for cause only, such as mandatory progressive disciplinary rules before firing or indicating the employee will become permanent after successfully completing a probationary period. Proving an implied contract is very much fact-sensitive and based on the totality of circumstances. To fully understand your rights, call Schleifman Law, PLC, a business attorney in Fairfax, at 703-528-1021.